Thematic Fine Art Prints is a supplemental fine art program consisting of 30 fine art cross-curricular packages based on Open Court Reading themes. 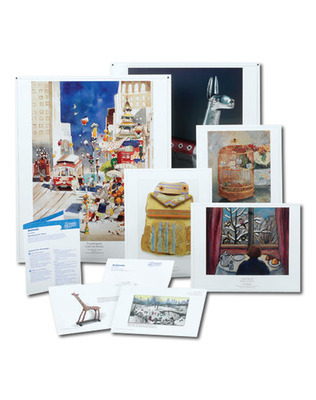 The packages can be used with the Open Court Reading program or can be used by non-Open Court Reading teachers and art specialists to support general classroom themes or a simple fine arts program. Direct correlation to Open Court Reading: Each thematic package is directly correlated to Open Court Reading, making it easy for Open Court Reading teachers to expand their lessons using the fine art and cross-curricular suggestions provided. Wide selection of themes and cross-curricular activities: The wide selection of themes makes the program flexible enough to work in any classroom, with any subject. Writing Prompts: Writing prompts can be used to provide extra writing practice or "inspiration" during regular writing and language arts instruction. Concise, easy-to-use format: A wealth of information on the artists, artworks, media, and activities is presented in a concise, easy-to-use format, so the teacher can seamlessly incorporate them into a lesson. Literature Connections: Each package lists thematically related books from the OCR Classroom Library, making it easy for teachers to incorporate literature into their lesson plans.